So many things to blog about but so little time since Venus Transit. Will update his blog with more details when I have the time. But until then, this is the summarised version. 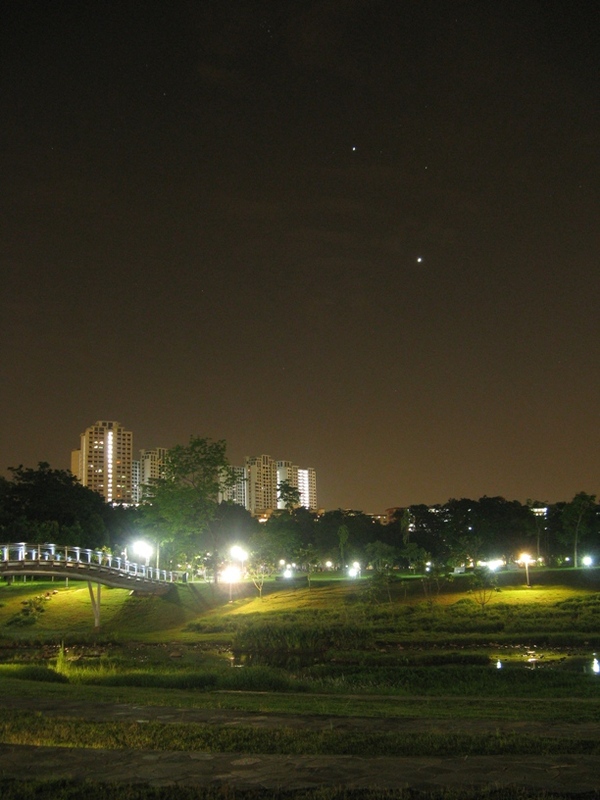 Last Friday, 20 July 2012, I joinedn the usual Bishan sidewalk astronomy group for a overnight session. During sunset, manage to meet up with Haz and friends. Had a wonderful chat with Haz to find out more about the holy month of Ramadan from a Muslim's perspective, especially the astronomically related aspects -- sighting of Moon to initiate Ramadan, being aware of a sudden special change in the environment/atmosphere during the last 7 days. I have heard about this special event during one of my Toa Payoh sidewalk sessions a couple of years ago from a Malay by-stander and was fascinated by it ever since. Later in the evening, was glad to meet up with an old friend whom I have last seen one year ago at the Saturn opposition sidewalk event at Toa Payoh. She brought the same amazingly portable 8 inch newtonian telescope and we had a wonderful time viewing objects through its quality optics. Glad her brother came along and we have learned so much from him and were amazed by the photos he showed us regarding his participation in overseas star-parties. Eventually, we stayed overnight (Saturday morning) to catch the conjunction of Venus, Jupiter, Aderbaran, Hyades and Pleiades star clusters. For Dave and Haz, I think it was the first time they saw Jupiter and its moons through their own telescopes. Their enthusiastic (and crazy?) reactions when they saw it reminded me of my own exhilaration when I first saw them through my first telescope. 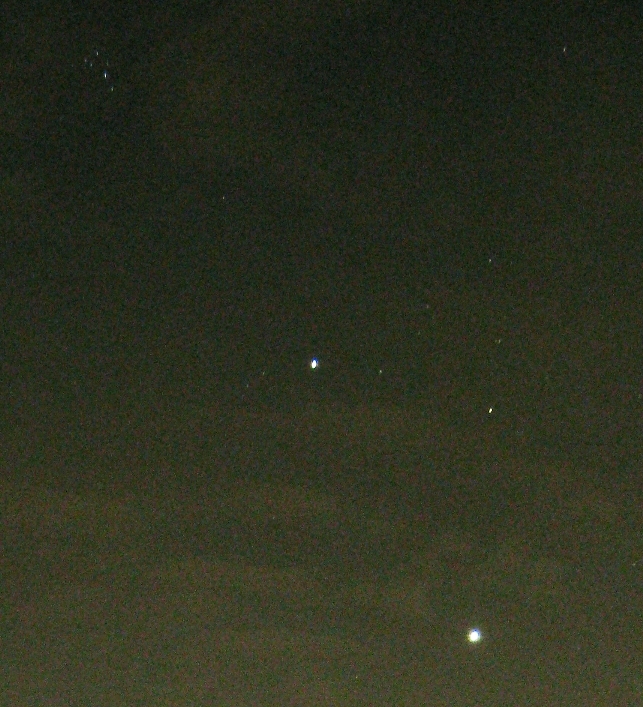 This is a photo of the conjunction I took with my compact camera with an exposure of 5 seconds. The brighter "star" at the bottom is Venus, the "star" to its upper left is Jupiter and the very dim star (no inverted quotes this time :)) is Alderbaran, the brightest star in the constellation of Taurus the Bull. This is the conjunction enlarged. The fuzzy bunch of stars at the top is Pleiades. Also commonly known as Messier object 45 (m45) or Seven Sisters or Subaru. The logo of Subara the car manufacturer is inspired by the visual appearance of this star clusters. They can be seen clearly on a clear night or early morning even in light polluted cities like Singapore. Photos cannot do any justice to observing them live with naked eyes or through telescope and binoculars. Venus is so bright nowadays its almost unreal! Jupiter and Venus is so bright now it can even be captured as 2 dim white dots in a normal phone camera which usually has poor low light capability. Try to catch them in the early morning skies nowdays before sunrise. 5am-6am will be good time as they are high enough in the sky to be seen. Find a place with an unobstructed view of the East and pray for clear skies! Great sidewalk and catch-up session overall. Seeing such a glorious sight was great. To know that the very same day marks the beginning of the holy month of Ramadan in Singapore makes it extra special for me even though I am not a Muslim. What a great festival to remind its followers of their religion in today's world when there are so many temptations that try to distract people away from its peaceful spiritual self. One day out of a year, one may forget. Thirty days AND fasting makes a stronger reminder. In any case, fasting in a healthy manner has been scientifically proven to be beneficial to the human body. So ultimately, it is for the benefit of its practitioners and not a form of "punishment" as some people would like to believe. Lastly, I would like to wish all my Muslim friends and readers a very blessed and peaceful Ramadan. May all of you experience the special event during the last 7 days especially during your prayers!